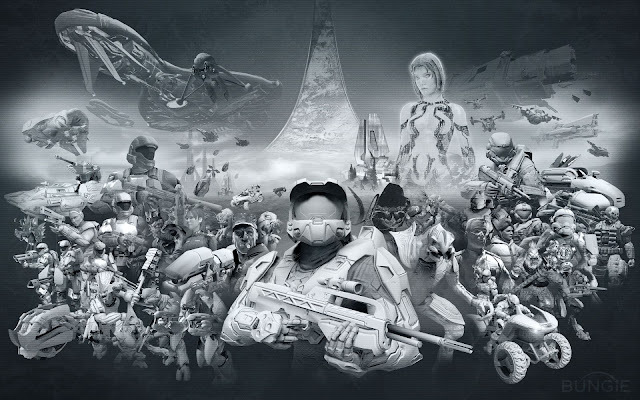 Having played, and completed, every single Halo game on legendary difficulty co-op with my brother, since it's inception over 10 years ago, I find this image very sad. yup. but cool none the less! I saw this and felt so many conflicted emotions. I think it shows that, in the end, Biungie still cared about the fans that made them great. In one shot we see everything that has involved fans, gamers, designers and engineers for a decade of fun, laughs and tears. I think the title is fitting, goodbye to the fans and farewell to bungie. And as we look to the next evolution of gaming, let's not forget where it all started. And let's also not forget the dangers of posting on a smart phone. Spelling errors FTW.